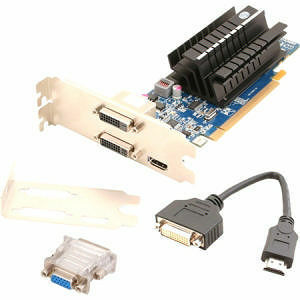 The SAPPHIRE HD 6450 FleX incorporates this SAPPHIRE exclusive feature into a mainstream graphics card and delivers the most cost-effective Eyefinity solution available for increased productivity in tasks such as editing or business applications. It can also be used in multi-screen information display systems where three low cost monitors can be directly connected to each FleX card installed. The SAPPHIRE HD 6450 FleX can support three DVI monitors in Eyefinity mode and deliver a true SLS (Single Large Surface) work area. The first two monitors are connected to the DVI outputs, as usual. A third DVI monitor can be connected to the HDMI output with the passive cable adapter supplied. Thus three DVI monitors can be used in Eyefinity mode without any additional investment.